Light yet tasty and full of flavour. Makes you feel healthy eating it. 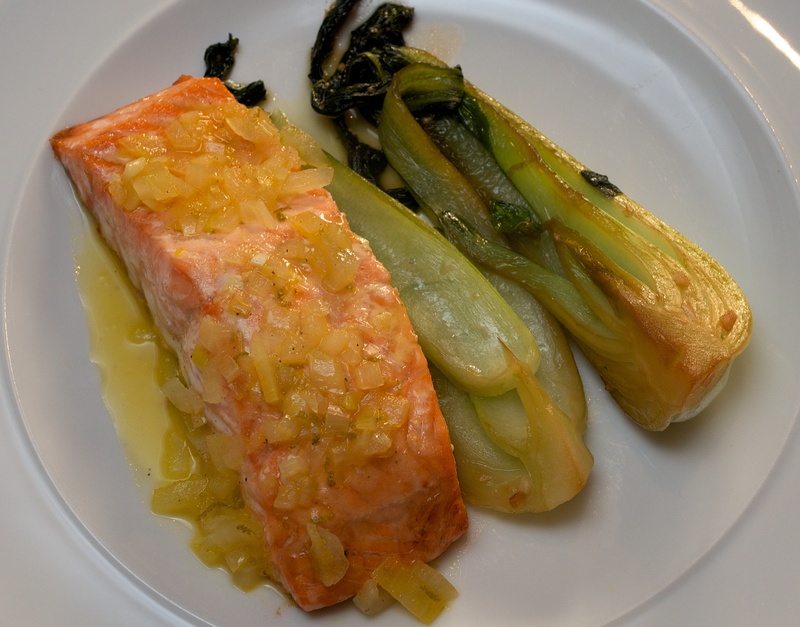 Wine Suggestion: Some lighter styles of white wine can be overpowered by salmon. We went for an Italian grape variety called Pecorino which has a bit more body and a nice lemony flavour to complement the sauce. Line a baking tray with kitchen foil. Heat a little olive oil in a small pan, add the onion and one of the garlic cloves, and cook for about 5 minutes or until soft. Add the orange and lime juice and the lime zest, then simmer gently until reduced by half. Season. Meanwhile, put the salmon fillets on the baking tray and bake for 15-20 minutes or until just cooked trough. Heat a splash of olive oil in another pan, add the pak choi and stir-fry for a couple of minutes. Add the remaining garlic, the soy sauce and honey, and keep cooking for another couple of minutes. Serve the salmon with the pak choi and the sauce drizzled over.